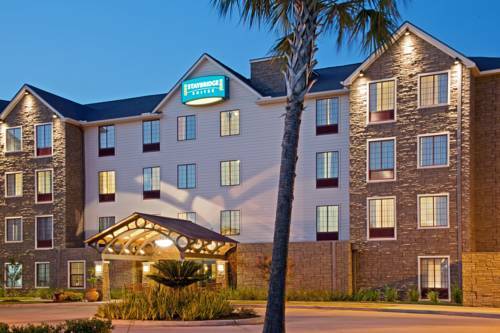 Welcome to the Staybridge Suites, Houston -Willowbrook. Outdoor heated swimming pool that overlooks the golf course. Walking distance to the Sandtrap Grill at the Heron Lakes Golf course for food and drink. The hotel is in the Willowbrook area of NW Houston and located just 1.2 miles south of the Willowbrook Mall with stores such as Dillard's, Macy's, JC Penny and more. Historic Houston Steakhouse and Seafood. 450 sq. ft. with one window, adjustable thermostat, 9ft ceilings. Children's program - Outdoor swimming pool. 18-hole golf course attached to Staybridge Hotel Houston Willowbrook. $14 mid-week rate and $20 weekend rate includes golf cart. Rental clubs are available. Sandtrap Grill offers American fare and includes a full bar. Pro Shop on-site.